How does the Assessment Tool work ? The information asset management tool enables agencies (by answering a series of questions) to position their requirements and capabilities against the Information Asset Management Maturity Model. The Information Asset Management Maturity Model has been developed to provide agencies with a means of determining their current ability to manage information assets together with an assessment of future requirements. These results, including factors such as size, shared services arrangements and so forth should be used to recommend solutions to meet the needs of agencies and will direct agencies to Information Asset Management Systems which offer an appropriate level of functionality on the Government Selected Application Systems (GSAS) panel contract. The results of using the Assessment Tool are intended as a guide only, and directly relate to the selection of responses entered into the tool by the agency. It will be at the discretion of the agencies to select and negotiate the purchase of an Information Asset Management System (according to Government Selected Application Systems (GSAS) guidelines). Each of these layers is represented by a series of questions in the Assessment Tool. Completing this section of the Assessment Tool will assist agencies frame the type of Information Asset Management System appropriate for them. When considering the product options available on the Government Selected Application Systems (GSAS) panel contract, agencies will need to be aware of staff numbers (for licensing options, eg. concurrent or per seat), geographic spread and location (for implementation options, eg. web enabled, LAN etc). This is also an opportunity for agencies to consider shared service arrangements with the Central Corporate Service Unit or NSW Buinsesslink. This section of the Assessment Tool relates to the current information management systems in place in the agency and the business decisions being taken to use and / or change those systems. Agencies need to consider the business reasons for recommending the purchase of a new Information Asset Management System, and include these observations in any business case they prepare for Gateway review. ability of the agency to implement change. There are plans to enhance this section of the Assessment Tool by enabling the generation of a report detailing the level of State Records Act compliance, and an overall weighted position / score against the Implementation Capability Scale. 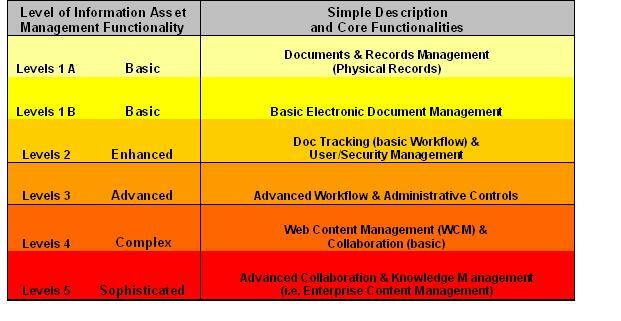 This section of the Assessment Tool considers a range of information management needs including; records, document and content management, as well as collaboration and knowledge management functionality. The headings in this section of the Assessment Tool are aligned to the technical specifications used to evaluate vendors on the Government Selected Application Systems (GSAS) panel contract. Agencies are asked to complete the questions considering the current needs and capability of the agency, and also the projected needs of the agency in five years time. This assists in recommending a product that will provide best return on investment. Agencies are encouraged to leverage existing investment to reach their recommended ‘level’ and adopt solutions which complement existing agency systems.